With less than a week until the filing deadline for Fort Thomas City Council and Mayor among other statewide elections, Mary Brown has informed Fort Thomas Matters that she will not seek reelection. Brown has served on council since 1977 and has been at the helm of City Council since 1999. "It's been a very hard decision," said Brown. "But this seemed like an opportune time to have a retirement of sorts. I'll be leaving the city in good hands and in a good position." Currently, no one has filed to run for Mayor, but it has been long since rumored that Mayor Pro Tem, Eric Haas, would throw his hat in the ring when Mayor Brown decided to step down. Mary and Bart Brown have been residents of Ft. Thomas since 1966. They have 7 children, 19 grandchildren and seven great-grandchildren. 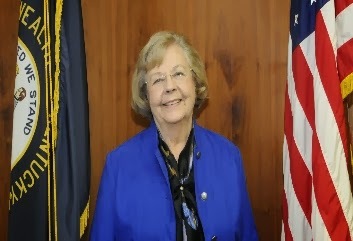 Mary was elected to City Council in 1977 and has been a member of the Board of Council for 35 years. She served as Mayor Pro Tem for 2 terms, then was elected and sworn in as Mayor in 1999. She graduated from St. Mary-of-the-Woods College, and is a member of St. Catherine of Siena Parish. Mary served on the Board of Trustees of the Greater Cincinnati United Way & Community Chest and the Northern Kentucky United Way Board. Mary has been involved in community activities and organizations for many years and in 1989, was named one of the Cincinnati Enquirer's "Women of the Year." She is a volunteer on the Ministry Team of St. Elizabeth Hospital, Fort Thomas. She served a nine year term on the Board of Trustees of St. Mary-of-the-Woods College and currently serves on the board of Trustees of Thomas More College. Since becoming Mayor, she has joined in the River Cities Government Coalition of SouthBank Partners.